But I go beyond that. And you should, too. Do you need a plan for today? Do you need to learn a new habit? Reach your goals? Take a moment and jot down what you want your planner to do for you. Look over your list and decide HOW you are going to accomplish what you need to accomplish. I make prep lists for leaving the house (both for the daily and master lists for certain errands, like going to work or going to workout). I am planning a daily goal for writing and a time for writing on my daily dockets (circling it so I remember to copy the task of writing from day-to-day). I track my calories (sometimes) in my project pages. 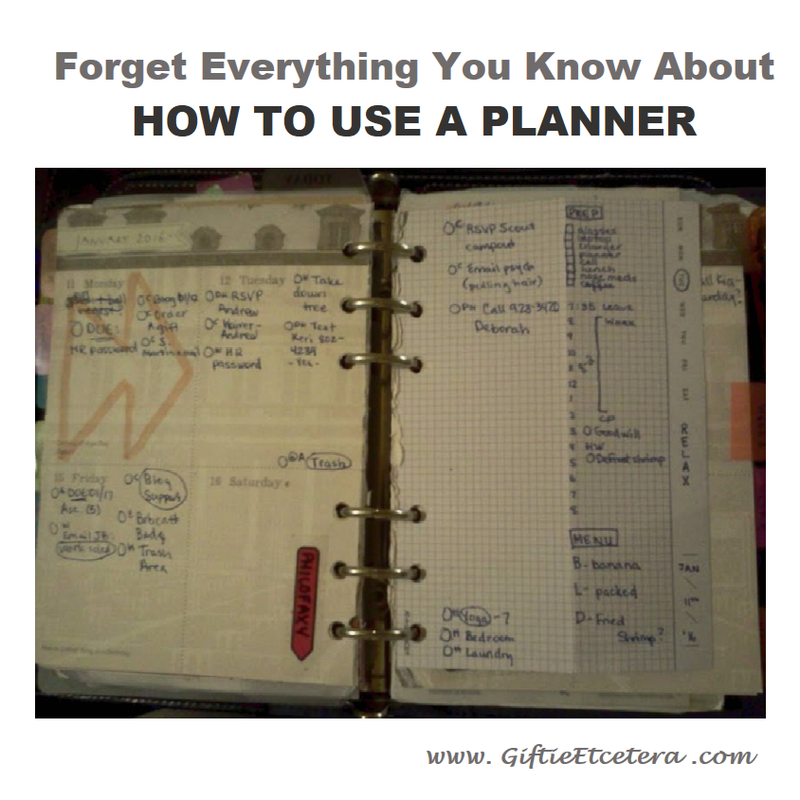 Take a minute to consider what you want to add to your planner, search Giftie Etcetera for ideas, and put improving your planner on your task list for this month! TIP: Use graph paper to create your own daily docket with a set-up that works for you. Print it for free from the internet and cut it, or purchase it for Franklin Planner Classic or Compact binders (stapled together, but easily separated and hole-punched). I'm always tweaking my planner to work better or to deal with various life changes. Lately, I realized I needed some permanent checklists for things I do repeatedly. I think I can remember them, but with the craziness of life lately, I slipped on some of them.